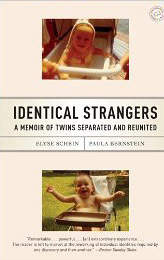 Identical Strangers: A Memoir of Twins Separated and Reunited, by Elyse Schein and Paula Bernstein, is an amazing book in many ways. The memoir is the story of twins separated at birth, and of their reunion decades later. 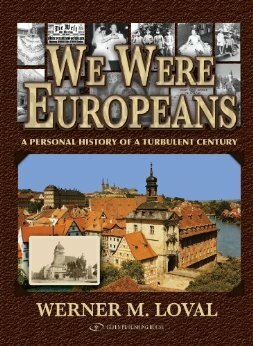 Twins are fascinating to most people, the concept of sameness is intriguing, and this memoir enhances that perspective, defining what it means to be a twin through a unique perspective. Elyse Schein and Paula Bernstein both knew that they had been adopted. Neither one knew they were twins. 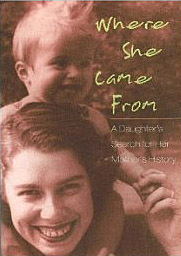 Elyse wanted to learn about her mother, while Paula had no desire to know her. The book details, in alternating voices, how both women have had to overcome their separation and try to accept their sameness and their differences, accept the fact they are twins, sisters, family members, reunited. Their awkward transition into sisterhood and extended family is written with clarity, and truthfulness. To be twins is one thing, and to be separated through adoption is another thing, to be both is to ponder the idea of identity and family. It was appalling to read how Paula and Elyse were separated, and how the adoption agency, along with psychologists sided together to manipulate the system and their very lives. The insensitivity is incredulous. We hear their differing, yet similar, voices evoke the emotional impact that their reunion has made upon their lives, as separate individuals, and as twins…duplicates of each other. We are witness to their doubts, fears, joys, and their capacity to try to adapt and join their lives together. We are also given insight into how finding information out about their birth-mother has affected them. We see how they view the definition of “parent“, how they define a parent, and who they consider a parent to be. We question how nature and nurture affects us, and are we a product of one or the other, or both. Identical Strangers: A Memoir of Twins Separated and Reunited is relevant and compelling on so many levels. It leaves one to question parentage, bloodlines, familial bonds, adoption, what it means to be a twin, and the imprints left on our lives by birth, circumstance, environment, relationships and DNA. Elyse Schein and Paula Bernstein bring us a memoir that is poignant and thought-provoking in its honesty. It is a book not to be missed. I read Identical Strangers in one sitting, while in a book store, unable to put it back on the bookshelf until I had finished it. 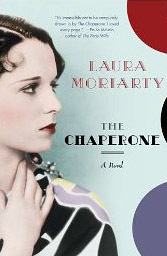 The Chaperone, by Laura Moriarty is a book whose main character, Cora Carlisle, is a chaperone to 15-year old Louise Brooks, a young woman who will be studying modern dance in 1920s New York City. Louise is a handful, in more ways than one, and involves herself in confrontations and situations that keep Cora wrestling, not only with Louise, but with her own conscious, leaving her little time to breathe. She was hoping to be able to do some long-wanted research while in New York City. Cora is married with grown children, and has taken the opportunity to chaperone Louise in order to answer some long-held questions of her past. This reader watched Cora grow throughout the novel, not only emotionally, but also grow and adjust to the ever-changing world of the time period. Her daily visions of poverty and the roles of women were penned with illuminating scenes. Yet, within Cora’s growth, time seemed to stand still at times, due to the often drawn out paragraphs. I thought that Moriarty did an excellent job of writing the story line. Her reflections of history were spot on, and her word images were crisp and concise. Her interpretations of the mores, manners, and social ideals that were predominate in 1920s Kansas were accurate, as well as the accuracy of New York City’s ethnic diversity and social standards. 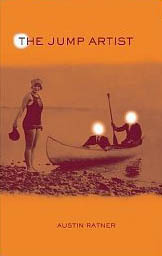 Yet, I felt the predictability of the story, especially in the last half of The Chaperone. That predictability tended to bore me a bit, and I felt the author was trying to rush things in order to get to the end result. Overall, The Chaperone, by Laura Moriarty, is a novel that displays the time period well regarding the historical factors within the pages. The The life of Louise Brooks (who did go on to become a silent screen star), is actually second place to Cora’s story, in my opinion. That is not to say that it diminishes the story, after all, the title reflects the content. The story is more about Cora and her adjustment and visions of life, visions that had been locked up until she went to New York City, where her eyes were opened. On a scale of one to five, I would rate this a three. I liked it, but, overall, it was not the story I thought it would be.